Last year I was on the expressway coming back from my parents house, when during a wide open throttle session......I hear a loud POP followed by smoke and the motor running really rough. When I pulled over and looked under the car, I see oil bleeding out and again black smoke bellowing out from the tailpipes and under the car as well. My initial diagnosis was a blown turbo, but after doing a more in-depth investigation I saw nothing wrong with the turbo. At this point I did a compression check on all cylinders and found that the number 1 cylinder was completely dead. Seeing this was towards the end of the driving season, October (I live in Chicago, driving season doesn't last that long) decided to put the beast into hibernation. Moving forward, to this year. I finally have some time to work on the motor. I decided that this would be a great project to do with my dad (retired mechanic) kind of a bonding project. Anyway yesterday I took apart the motor and found whats to be one of my most frightening nightmares a Porsche owner can have a blown/disfigured cylinder and cylinder head. Further inspection, revealed all 6 pistons and 5 cylinders are in great shape. Barely any wear as the motor was rebuilt by the previous owner about 35k ago. I have attached pics of the 1 cylinder and cylinder head. You can see there is a hole between the cylinder and cylinder head. In addition, I've attached pics of the timing chain housing that also has a hole in it, which seems to be a result of the gaping hole from the cylinder and cylinder head. On the rocker arm for cylinder 1, we noticed that the shaft for the rocker arm had moved its way towards the front of the housing. Below are a few questions I have for my Pelican members. I ask that you please give me your input and most importantly I appreciate all your help. What could have caused this catastrophic failure? Why would the rocker arm shaft have moved itself? Will I need to replace the cam housing? Can I just replace the number 1 cylinder and cylinder head or would it be best practice to replace all pistons and cylinders? Again thank you all in advance for your help!! 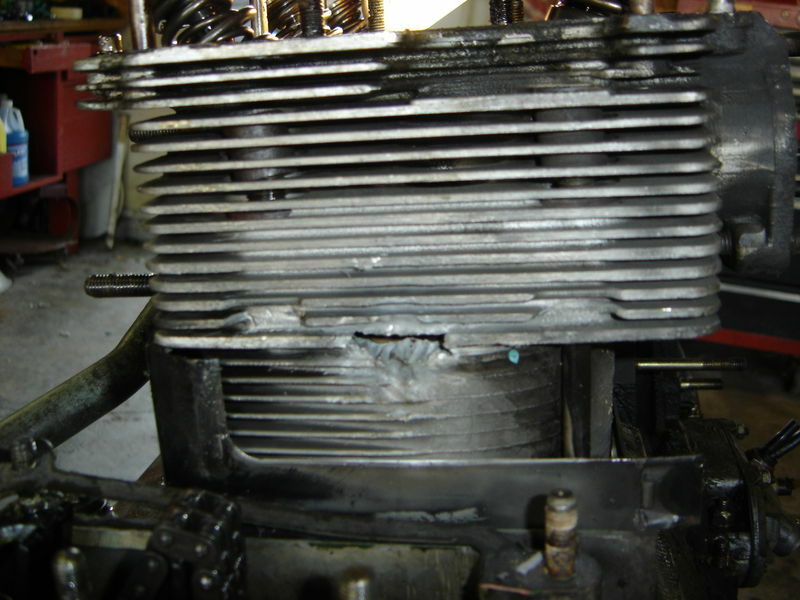 I'm no expert on engine failures but this looks like others that I have seen on this forum which have been attributed to an extremely lean condition on that cylinder (maybe a plugged injector?) - also, were the cylinder/head studs sill holding their proper torque on that cylinder? As far as the walking rocker shaft, probably due to insufficent torque during installation . . .
Last edited by Ronnie's.930; 09-18-2011 at 01:23 PM..
As far as the walking rocker, probably due to insufficent torque during installation . . . 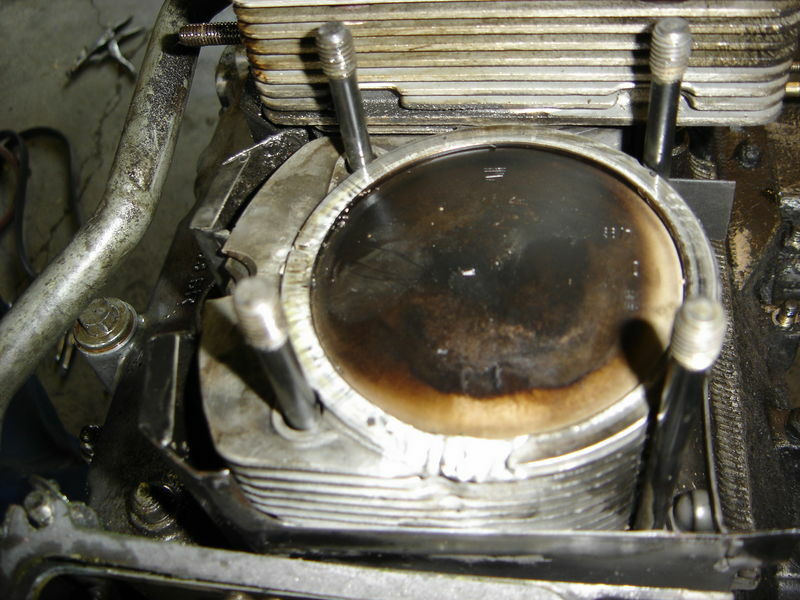 Seeing the colour of the top of the piston ...... I wouldn't say it was lean. Good point! The edge near the burn point sure is light colored, though . . .
Ronnie: I did not check the torque settings on the rockers nor on the head studs, didn't think about it then as I was still in shock from my finding. As for running too lean, this could be one assessment that could have caused the engine failure. It could be at that moment, an injector could have failed as a result.....well the big boom. This is why now I am looking into EFI.....I know I'm asking for it but hey figure while its down make the most of it. .....This is why now I am looking into EFI.....I know I'm asking for it but hey figure while its down make the most of it. EFI is not a miracle solution and it doesn't avoid all kinds of problems. Couldn't agree more. After spending the summer wading through various CIS issues (I had more than one) I now have a better understanding of and comfort level for CIS. Now if I decided that I wanted to have a 600 hp engine, EFI is the only option. A properly tuned and maintained CIS is a cost effective system for many. Dan, when analyzing engine failures, it's difficult to arrive at the absolute cause with 100% confidence due to the extensive damage that occurs. I'd suspect an injector issue as the root of your problem. My car is a little younger than all 930's at 20 years old and I've had to replace all of the injectors due to issues with poor spray patterns and leakage. Do you have a mechanical boost gauge in the car and do you know how much boost you were running? I agree it does not avoid ALL problems but, does remedy some. I hope I did not convey I was looking for a miracle potion, if so I apologize. Again, thank you for your input. At this point I really do not want to get into the debate about CIS and EFI as I know how we can easily veer off subject. Yes, due to the extensive damage it is difficult to certainly come to a conclusion. I figured I will post the question and see if my theories stand firm. Again, thank you ALL for your replies thus far, it is much appreciated. I do have a mechanical boost gauge. At the time of the big bang, the reading was a little less then 1.0 bar (935 boost gauge with last reading feature). There are lines of carbon from combustion leakage around most of the head to cylinder sealing surface on the top of the cylinder. It would help to see the combustion chamber side of the heads too. 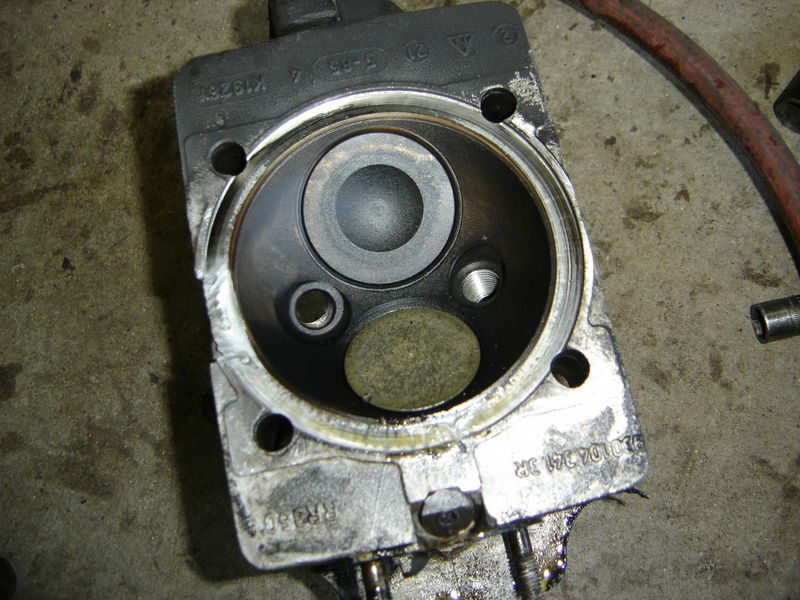 My guess is the head studs were not torqued correctly and they loosened up more over time duting running and heat cycles and this eventually happened. Combustion pressure was leaking - you can see that from the carbon trace lines going outwards from the center all the way around on the cylnder deck sealing surface. You are making a very good point. Below is a pic of the head. Check your timing and AFRs. It is even more interesting that the lean section is on the top rear of the cylinder where the spark plug is located. Loose head studs may be the cause. Were you running a wide band O2? My thoughts exactly. Same failure I have seen when a head lifts under full boost. We have seen a lot more of this in the past couple of years. 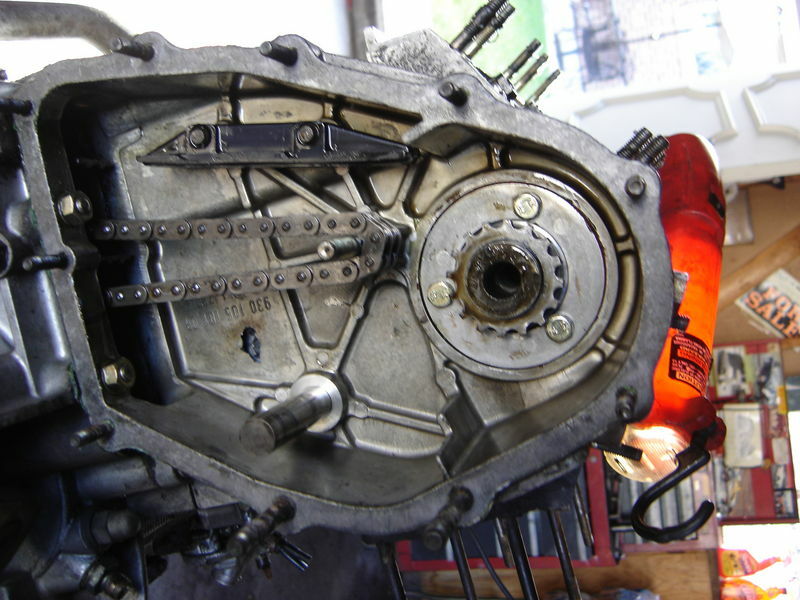 When these engines are rebuilt or someone's gone through the top end, and they aren't kind in the removal of the rocker shafts, they gouge out aluminum from the cam housing's bore. Same goes for when the shafts get polished to clean them up (better to just replace them). We had 2 different engines where the rocker shafts shifted when the engine was hot, full boost on the dyno. Significant oil leaks ensued when one shaft moved, and the drips onto the glowing hot headers could have flashed into a fire. It troubled us enough to come up with our Rocker Shaft Locks. No more migrating rocker shafts, no more oil leaks. i keep having the same problem with the rocker shafts moving i have replaced them all with new genuine porsche ones and a couple still moved. there is a dab of rtv holding them now but next time it comes apart for efi swap i'll put the turbo craft locks in. Sorry to be so intrigued by your engine failure but it's a bit like a good murder mystery. In the picture of the head, the exhaust valve looks to have a knick on it? The machine work for the twin plug looks decent but maybe when the heads were surfaced machined there were deck hight differences? Also did you hear any detonation and could you have had poor fuel quality? Be good for everyone to see the cam housings and what went on with the rocker shaft shifting. I think Chris's kit is clever solution to salvage the worn cam housings.